"The city is experimenting with new kinds of infrastructure that separate bikes and cars. These lanes give bikes an entire, regular sized lane of traffic on two downtown Portland streets, demarcating it with a solid line and buffered areas between the other travel lane and the parked cars on the other side." 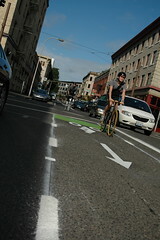 The two streets, Oak and Stark, run east and west and have the buffered bike lanes from Naito Parkway to SW 14th Ave. Elly has posted a great set of photos with captions describing each shot. They are well worth checking out. Along with the city's wide, buffered lane project on SE Holgate and the new cycle track on SW Broadway at PSU, the new bike lanes are starting to really transform some of our streetscapes. What do you think?